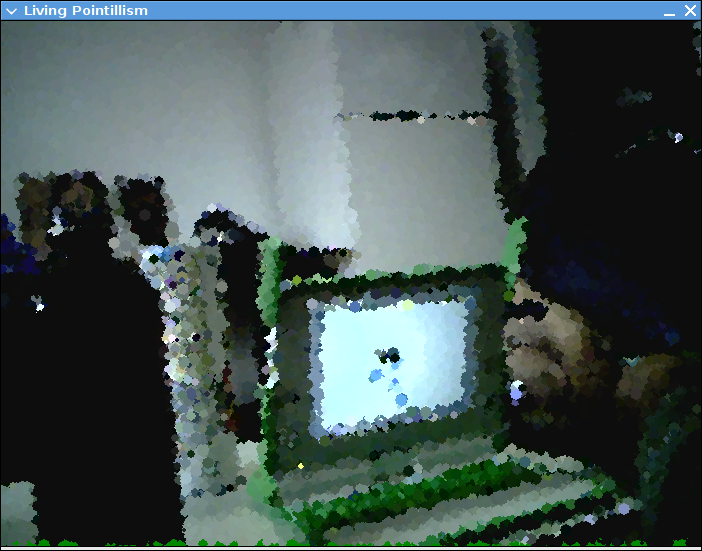 Living Pointillism is a quick little example script I wrote to showcase the camera module I’m writing for pygame through GSoC. It places a few dozen points (it automatically changes the number based on the framerate) for every frame of video, so the image is only clear if everything is perfectly still. This also results in some interesting visual effects when things are in motion. The screenshot above doesn’t quite capture the essence of it, but I don’t have the kind of bandwidth here to upload a video. It runs fairly well on the OLPC XO too, and I’ll release an Activity for it along with an rpm of my branch of pygame soon. Update: This is now available packaged as an OLPC Activity. Update 2: Pygame with the camera module should now be downloaded from the Pygame SVN. I got it working on my system, very cool. Good luck with your Summer of Code. Ooh, looking forward to the Activity. That is actually a pretty neat trick, thanks for sharing!